It's hard to think, let alone write, on no sleep. Which is why, I think, it just so extraordinary that there are so many parents out there producing such good writing - we're all so frequently sleep-deprived. How does any parent manage to think coherently on those long, foggy, sleep-deprived days, let alone spin thought into word and weave prose? I'm currently sleep deprived, but it has nothing (ok, little) to do with being a parent. WonderBaby has gone back to her regular 13-hour stretches, for the most part - she does still occasionally rise early and request a transfer to Mommy and Daddy's bed, but this is never at any obscenely early hour, and it always results in an hour or two of drowsy cuddling that is undeniably soul-restoring - and so the nights are full of the promise of sleep. But only the promise of sleep. And this promise has, of late, been going unfulfilled. I just wanted to note, for the record, that although it was a long, wakeful night for me last night, as it was the night before that and the night before that... today was a good day. WonderBaby and I took a long walk in the bright cold sun and ran errands (happily running into friends along the way) and then spent the better part of the afternoon sprawled out on the floor of our living room visiting with more friends (the bigger of us sipping - yes- red wine) and I didn't feel the ick of the tired at all. Not one bit. OK, so the small people didn't sprawl. 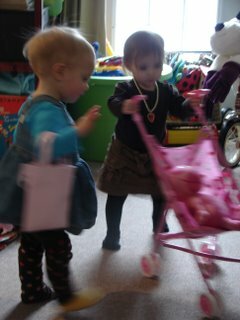 The small people were a blur of tiny handbags and scarves and bling and pimped-out stroller-rides. It was the mothers who were sprawled out on the floor. With their liquor. Good times. It was nice. Really nice. And now I am going to go to bed and sleep the sleep of the only-somewhat-dead until about 3am, at which time you will most likely find me, again, awake - but maybe not minding so much, this time. **Follow-up posts to posts with big words and involving big thoughts are on hold until semi-regular sleep returns and brain cells recharge. **WonderBaby didn't really Bratz that doll, did she? She really only kinda glammed it up a bit, no? 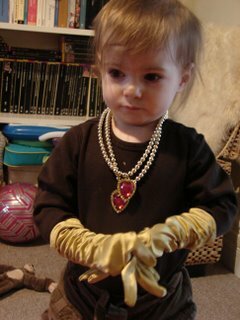 And not half badly, really, if one goes in for that sort of blingy, mismatched accessories look. But it wasn't really Bratzy - there was no cropping of tops, no baring of bellies, no donning of thong, no spackling of eyeshadow. So, there. I can cross one more thing off of my long-dark-teatime-of-the-soul list of things to think about at 3am. 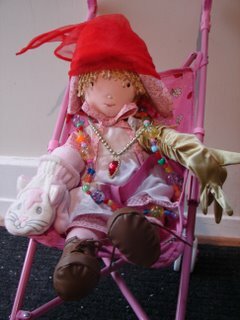 This, WonderBaby's caregiver informed me, was entirely the work of WonderBaby: she strapped Holly (Puff Holly? P-Holl?) into the stroller, she placed the bling around her neck, she put the mitt and glove on, and (this is, I feel, the most staggering thing) she fashioned the do-rag. She Bratzed her Holly Hobby, and I, for one, am reeling from the irony. Late-breaking edit - so, you know how I made a point of shunning the big blog awards last fall? This award is different... about as inclusive as you can get and still call it an award. Mom-101 nominated me for Most Thought-Provoking, which was just so flattering, because I really should be up for Most Neurotic, and/or Most Likely To Use Unnecessarily Big Words, but those weren't categories, so, um, anyway... SHARE THE LOVE. *Edited below! Because this post wasn't quite long enough! If you were cruising the mom-and-dad-o-sphere this past weekend, you no doubt became aware of the crime against sanity that was last week's Today Show discussion on mothers who tipple (a discussion that included our very own Melissa and Stefanie). Apparently, mothers who drink alcohol in front of their children - any drink, any amount - are compromising the well-being of those children. From what I understand - not having seen the episode - we're not talking martini binges or raging alcoholism here. We're talking wine-coolers during playdates, a beer in the backyard, cocktails before dinner. We're talking about the ordinary indulgences of a normal adult life. Again, to be clear, I didn't see the episode. I wouldn't have known about it if discussion of it hadn't exploded in our corner of the blogosphere, and everything that I do know about it has been gleaned from that (excellent) discussion. You can watch it, if you like, here. I simply can't bring myself to watch; I'm certain that my head would explode from the nonsense of it all. In any case, I don't want to debate, here, the merits of the argument on either side. I was prepared to dismiss the discussion entirely; it was just, I thought, one more absurd scuffle in the ongoing effort to stir up controversy around and about moms. Ignore it, I thought. Let it die. But it's been nagging at me, causing me to stare out of windows and furrow my brow and pick at my fingernails until my husband asks, are you worrying again? Yes, I've been worrying. But why? Why why why... well, to begin, because this is not just about stirring up controversy on slow news days; this is not just another salvo in the so-called Mommy Wars. This kind of suggestion - that mothers need to watch their behaviour, that the terms of motherhood are a public concern, that we need, as a society, to keep watch on how mothering is done for the sake of the children - is a very old, very powerful, very dangerous suggestion. It is one that, if it evolves from suggestion to idea to value or norm or (god help us) policy, never brings any good to women. Talking about the treatment of women under the Romans might seem to be just so much pedantic digging on my part - it was, after all, a very long time ago, and a very different social and political culture. But the example of the Romans - and their understanding of the necessary distinctions between public and private virtue, and the health of the private (the family) as necessary to the health of the public - had a tremendous influence on modern political thought, on republican political thought. And it should be clear to anyone who follows debates about motherhood that a very strong whiff of these ideas lingers over our heads. We speak in slightly different terms, of course. For us, it's all about what is best for the children, qua children: is stay-at-home-motherhood best for the children? Are happy, fulfilled parents - working or otherwise - best for the children? This is all fine, as matters of debate - for the most part, I think, reasonable people agree that happy, secure families can come in a variety of forms. There's no real danger of anyone seriously suggesting that women be made to stay home, because it's clear to reasonable people that stay-at-home-motherhood isn't necessary to the well-being of children nor to the integrity of the family. Phew. But doesn't it become a slightly different story - a slightly more dangerous story - when we wander into the specifics of the behaviour of motherhood? We wouldn't seriously propose that all families organize themselves in the exact same way, regardless of our personal opinions concerning the merits and disadvantages of SAH/WAH/WAH models, because we recognize that every family faces different circumstances, has different needs, etc. etc. There's plenty of space to get relativist about the big questions. But when it comes to the little questions - should mothers (and it is, always, always mothers; that's another issue entirely) avoid specific behaviours, avoid exposing their children to certain influences? - I think that we are more inclined to get prescriptively judgmental (mothers should do this, should not do that). And when certain judgments achieve some broad concensus, they may well become social pressures. It's tempting to dismiss this particular, and hopefully marginal, judgment - the purported risk to children posed by mothers sipping chardonnay at playdates - as harmless. No reasonable adult would agree that responsible consumption of alcohol corrupts children, right? But this argument got airtime - Today Show airtime - and it was, from I understand, flogged pretty seriously, and 'reasonable' arguments ignored or dismissed. And therein lays a problem: 'reason' gets suspended, sometimes, when we talk about what's best for children. There's such emotive force to the question, does this put our children at risk? Don't we all feel, deeply, in our guts, that when there's any question of possible danger to children, we need to set aside issues of our own personal interests and preferences and address that question as fully as possible? That the safety and well-being of our children trumps any other concern - including the concern to protect our own quote-unquote right to do what we want? What if it could be demonstrated that exposure to moderate drinking has a negative effect upon children? What then? Mightn't we all close ranks and tut-tut-tut those women who persist in selfishly pursuing their own pleasures at cost to their children? Women who buy Bratz Dolls for their daughters are, for example, amply tutted in certain circles. I have certainly been guilty of tutting on the issue of the sexualization of young children because I take it to be self-evident that toys and ads and such that promote early sexuality are potentially harmful to children. I'll admit, under pressure, that in my heart of hearts I wish that there would be stronger social pressure against this. I wish that mothers would feel socially constrained to not dress little girls up in tarty outfits. But isn't this just so much hypocrisy, given my frustration with those who would tut-tut social drinkers? If the difference is only that I feel strongly that I am right in my opinions (that I am convinced that mine are not opinions, but expressions of fact), and that those opinions should prevail, isn't there something illiberal - anti-liberal - about my position? Isn't there, maybe, a slippery slope from my argument that tarty clothes and Bratz Dolls for toddlers are potentially harmful to the argument that mothers should watch how they themselves dress? How many sexual partners they should have, if they are not married or partnered? How much physical affection a parent couple should demonstrate in front of their children? Doesn't the line between what I think is reasonable and what I think is absurd in matters of social judgment threaten to run pretty short? My main point is this: in prescriptively judging each other, in insisting upon certain sanctities in the realm of motherhood and the family, we risk enclosing ourselves much more securely than any Roman ever imagined. This is what alarms me about the Today Show propogating its judgment against mothers indulging in a little social drinking. But I'm also alarmed by the possibility that I might be complicit in exactly this sort of judgment: that however much I might bleat my own defense - I'm not saying that mothers who buy Bratz dolls for their kids are BAD; I'm just saying that I wouldn't do it myself (she said as she slurped her martini) - I am, end of the day, judging, and, maybe, quietly wishing that everyone would make judgments a little bit more in line with my own. And that, my friends, is what drives me to drink. Sic semper tyrannus. *Late-breaking edit. Joy said this in the comments: "if we say 'mothers should not judge one another. period.' doesn't that have a certain flattening effect? doesn't this type of moral relativism deflate activism and debate and not allow us to critique one another or certain ideals?" Yes, and yes - there was a whole digression in this post, at one point, on whether a certain variety of judgment is desirable and even necessary, but the post was already - ahem - long enough. So I guess that there'll have to be a part two. But in the meantime, what do you think? Shouldn't some space be preserved for judgment (even, or perhaps especially, for judgments we don't like), just to keep debate alive?